If you like little birds, succulents, and places fairies might hang out, this is the design for you. It's a birdhouse! It's a planter! It's possibly inhabited by fairies! That checks all of our boxes when we're searching for a great design. But seriously, this piece stole our hearts. It was made for small birds and succulents (aka just the cute things). Here's what you get: the reclaimed pine wood house, soil and moss for the "bed," and 20 little succulents to arrange however you fancy. Here's an idea: Make a "tiny garden" day out of it. Get two designs—one for you and one for a friend—and see how you each come up with your own unique arrangement. Handmade in California. Assembly directions and succulent care instructions included with kit. Succulent plant types may vary. I'm glad I got this. It came with all of the plants and soil and my brother really liked it. My only disappointment was the color of the wood. In the photo it looks more natural, but came with more of a distressed white paint. Birdhouse is the perfect size for small birds. All of the succulents came alive and they are all different. Once it shipped it only took two days to arrive. It's a Christmas gift for my boyfriend who loves birds and gardening so this is perfect for him. 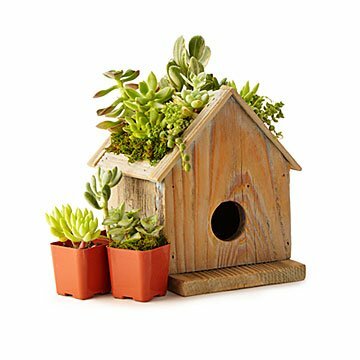 Due to the delicate nature of living succulents, the Birdhouse Succulent Planter should be opened at the time of delivery and should not be shipped to below freezing climates. Plants should be unwrapped right away and placed near a sunny window.